Cycle + Ride (C+R) is when you cycle to a Luas stop, park you bike at one of the free Luas Cycle Racks provided and use Luas to complete your journey. Then on the way home you take Luas back to your stop and hop on your bike. We want you to give C+R a try so we answered the top ten questions we get asked about it for you. Read on or jump straight to Question 10 How do I get started? Question 1 - Will it be a hassle? It's quick. It can be just as quick as going by car if not quicker and it's a lot quicker than walking to the Luas stop. You can skip the gym too. It's convenient. You can cycle from your door to the stop, there is bike parking at most Luas stops and trams running every few minutes. You'll feel better. It has lots of health benefits and reduces stress. You'll save money. For most people it is cheaper than running a car. It helps the planet. 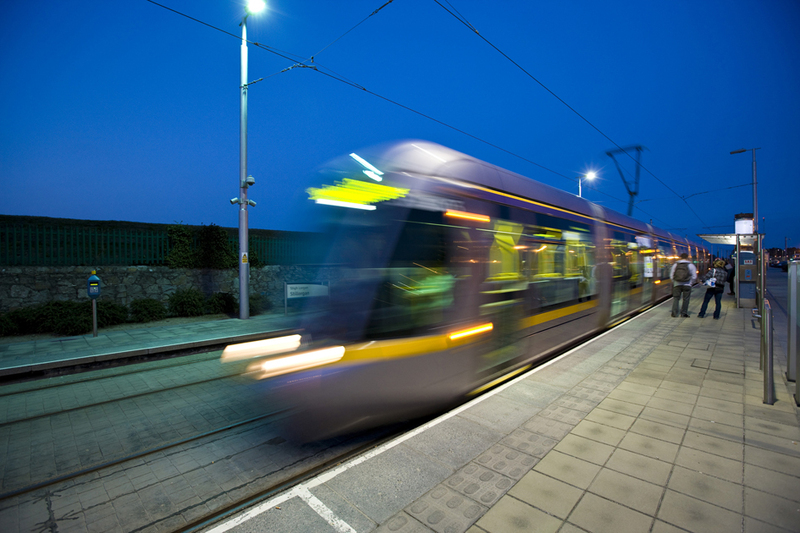 No CO2 from your car and to see how your Luas journey can help use the Luas Eco Calculator. Question 2 - Will it take too long? Measure the cycle from your house to the Luas then multiply each 1km by 3.75mins to see how long it would take you to cycle i.e. 2km walk = 7.5mins cycle. Download the Luas Cycling Map or log on to Google Maps for help. Add 1 -2 minutes to park your bike and wait for the tram. Select the Point 2 Point Journey Time for your Luas trip from this table. Time the walk from your Luas stop to your destination or estimate the length and multiply by 12.5min per 1 km. Add that up and you have your total journey time. Question 3 - Will I save money? We know that one size does not fit all but cycling and taking the Luas is cheaper than doing the same commute by car. Using the list of costs below add up all your car costs and compare with all your cycling / Luas costs to see what your saving could be. Question 4 - Will I feel good? Make you lose weight and keep it off. Increase your stamina and over time reduce fatigue. Ward off viral illnesses such as colds and flu. Reduce health risks including obesity, heart disease, high blood pressure, type 2 diabetes, stroke and certain types of cancer. Manage chronic conditions such as high blood pressure and diabetes. Strengthen your heart and improve blood flow to all parts of your body. Keep your arteries clear boosting "good" cholesterol and reducing "bad" cholesterol. Boost your mood reducing tension or anxiety. Keep you active and independent as you get older in body and mind. Fares: Peak fares apply 7.45am to 9.30am Monday to Friday excl. Bank Holidays. Off peak fares apply all other times. Question 5 - Will I need any special equipment? Question 6 - How will I deal with the rain? You just need to have the right kit for the weather and stay safe. Always have high visibility clothing so other road users can see you easily. Wear a waterproof jacket and leggings with vents so you don't sweat. Exercise extra caution on the roads. Put a shower cap over to saddle to keep it dry. Question 7 - How do I carry my stuff? If you have a light load use a backpack (with high visibility strips) or a basket. If you have a heavier load consider getting panniers, bags that can be fastened to the bike frame. Remember don't leave things on display when parking your bike; take everything with you. Question 8 - How do I plan my trip? Find out the nearest Luas bike parking to you. Ask an expert; talk to people in your area that cycle and get their tips. Ask HR about facilities like storing your helmet and waterproofs. Walk or drive your route to check it out; avoid narrow roads and busy traffic. Time it; consider doing a weekend trial to see how long it takes. Question 9 - How do I stay safe? Take care of your bike and make sure it is good condition. Read the Rules of the Road, especially the section dedicated to cycling. 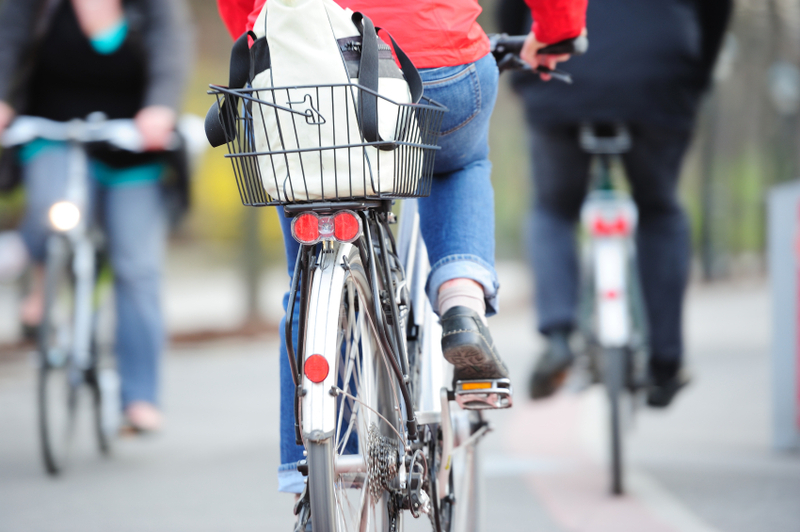 Be alert to what's happening around you; don't wear headphones while cycling. Have a white front light, a red back light and a rear reflector; a legal requirement. Wear high-visibility clothing and make sure backpacks etc. have high-visibility strips. Use cycle lanes at all times when available. Be alert in wet and icy weather. Tram tracks are slippery. Watch out for the groove of the track. Look and listen for trams. Prepare to cross tracks well in advance. Cross tracks using hand signals. Question 10 How do I get started? Dust off your bike and spruce it up making sure the tires are ok and that the chain is oiled. Consider getting it checked out with a local bike shop. If you don't have a bike get some tips online about how to pick a bike, check out if your eligible for the Bike to Work scheme and talk to a bike shop. Make sure you have comfortable clothing and safety gear; helmet, lights / reflectors and high visibility clothing. Hop on your bike with your friends or family. Check and see that your bike is working ok and that your helmet, clothing and safety clothing fit comfortably. See how fit you are, cycling should be no more strenuous than walking; if it's difficult take it easy for the first while. Trial your route; is it safe and how long does it take. Do your online research and talk to people. Check out the routes dublincitycycling.ie or http://maps.google.ie. Find out the nearest Luas bike parking to you. Talk to people in your area that cycle and get their tips. Talk to people in work and ask HR about facilities for storing your helmet and waterproofs. Before doing it every day do a trial run at the weekend. Time your journey so you give yourself plenty of time. For the first while give yourself a bit of extra time to cycler slower and get your bearings. Consider starting slow, C+R one day a week first. Enjoy your new routine and congratulate yourself on turning a boring commute into your daily exercise routine, a money saving trick and your bit to save the planet. Then send us an email with all your trips and tricks so we can pass them on.